The Orange Seed Project in Western Australia is giving a Not for Profit organisation the opportunity to receive a $60,000 gift and the opportunity to secure its funding for the future. The gift is comprised of a $25,000 Marketing Service Package (including Strategic, Design, Advertising and Digital) customised to the organisation’s needs, provided by marketing agency, Jack in the box, plus $30,000 advertising space in The West and $5,000.00 cash provided by The West Australian. The project will also be giving $90,000 of runner up gifts to all finalists. Nicola Bedwood from The West Australian says they have formed a great partnership with Jack in the box, which has lead us to be able to help the people of the West in such a significant way. Jack in the Box’s Orange Seed concept is derived from the view that a seed, with love and care, will grow into an Orange seed, and the seed can offer sustenance to all who wish to share its fruit. Once applications close on the 10 September 2012, the Judging panel will gather and begin the task of selecting 10 finalists. The successful finalists will be given the assignment to produce a three minute or less video to be presented to the public. After viewing the videos, the public will have a chance to vote for an organisation. The voting will indicate to the judges the level of public support for an organisation. All applications will be assessed by four judges; Peter Bryant and Susan Parker representing The West Australian; Scott Robinson representing Jack in the box Corporation; and highly regarded Director and businessman Michael Chaney, representing the Community. The Judges will be making their final decision in December and the winner will be announced at an ‘Orange Tie’ function in the Perth CBD. 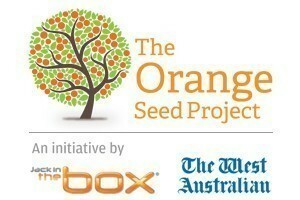 The Orange Seed Project applications can be found here.